Here’s a question……….. What is the main reason people visit London? I know you won’t have to think long or hard about this. The answer is blatantly that anyone who visits London goes there to visit Madame Tussaud’s, the wax museum. 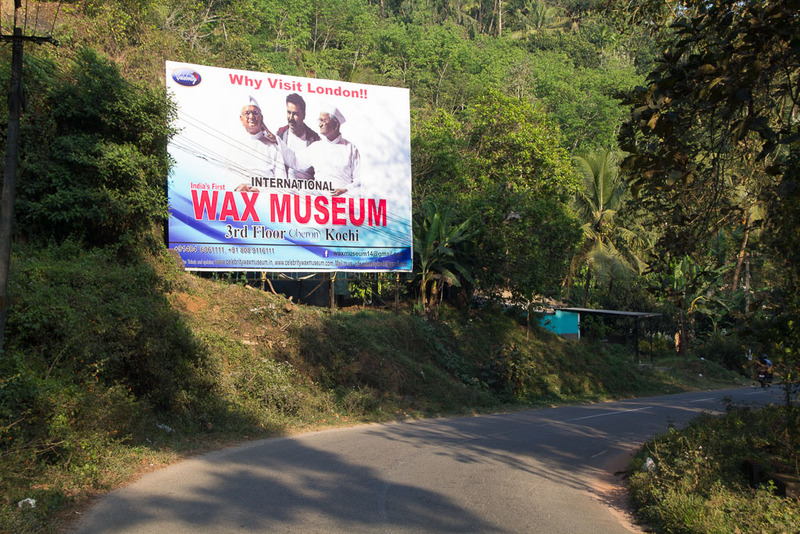 For years now, Indian people have been saving their hard earned pennies to go and see wax models of Mohammad Ali and Simon Cowell in England. There’s no other reason to gothere, apparently! Well, save no more my friends….. today we spotted this beautiful piece of advertising. You need never leave Kerala ever again to see life like recreations of Mahatma Gandhi, your prayers have been answered! Every day, we pass countless billboards, most advertise wedding shops and gold shops, they’re always colourful and quite often make us laugh and at the very least, help pass the time as we cycle along the more monotonous roads. And so we passed the time as we cimbed towards Munnar. Stopping for lots of water breaks, photo stops and to laugh at weird advertisments. The first day of our climb began relatively flat. But not nice flat, the sort of flat that rolls up and down continuousy making it hard work for our legs except without the benefit of the continuous climb, every time we gained height we lost it again with haste. We decided on an early lunch so that we wouldn’t have to start uphill with full bellies and had a pretty non descript thali at a small roadside hotel. The nerves were beginning to hit at this stage as we neared the start of our climb. And then we reached the bottom of the hill. 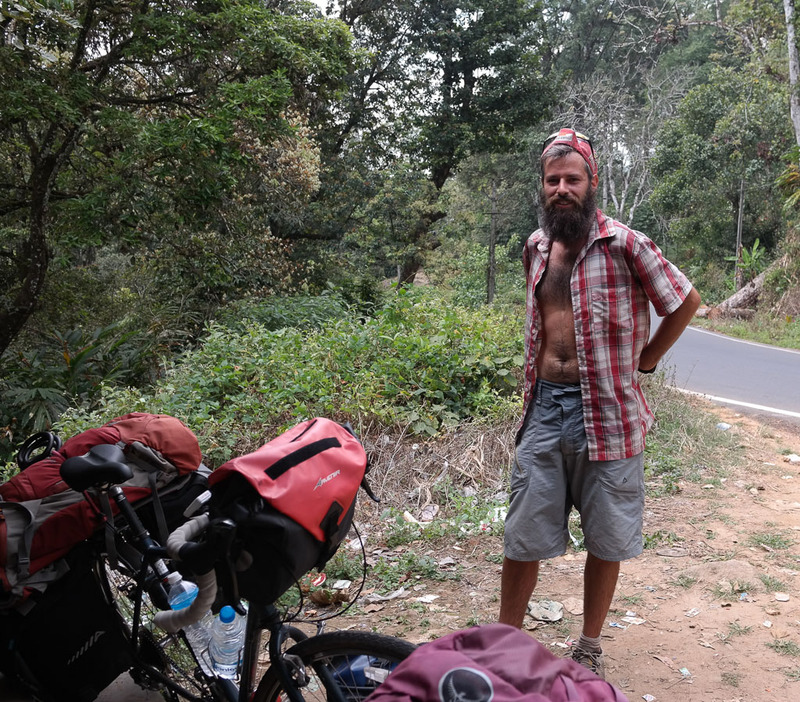 Stopping to fill up on our water supply at the bottom, the guy who ran the small stall took a shine to Sam and insisted onshowing him his pepper tree, curry tree and coffee plant and we were sent on our way with a cheery wave and a small supply of fresh spices! The climb began as all uphills do, with a sense of trepidation and some very heavy feeling legs. We always question why in the feck we have so much stuff as soon as we have to face a hill, but as our legs warm up and the kilometres pass, we always manage to do what we need to do. It helped enormously that there were no chasms in the road and despite some splurges where traffic built up, traffic wasn’t very heavy. Photo stops and water stops were numerous and despite the higher altitude, we were still sweltering under the afternoon sun. Our legs were getting to the limit of their ability when we reached the outskirts of Adimali, a busy crossroads town on the way to the hill stations. Our attempts to find a place to sleep were fruitful without too much fuss although we once again faced the weid phenomenen of mustachioed hotel owners shaking their heads sadly, telling us their hotels were full as tumbleweed floated by in the background. The owner of the place we stayed in is a wee bit mad. He nearly fell over with excitement when he found out our names and every time he sees us, he seems part surprised and part giggly. I’m not sure he’s had foreigners stay before. Our room was a weird affair. We had a tv, and four beds all pushed together like some sort of weird seven dwarves scenario. Today when we awoke we grabbed a few quick parathas with some fruit, downed a coffee and got packed up to leave once again with butterflies in our tummies. 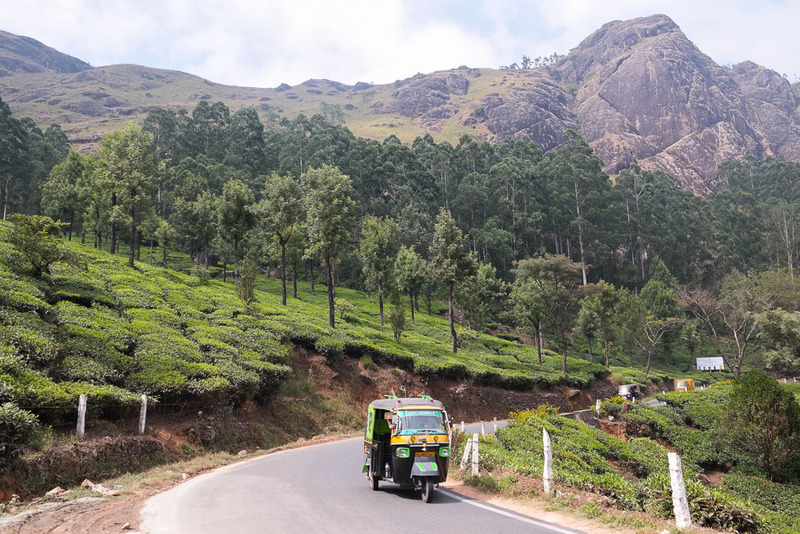 The cycle up to Munnar is our longest, continuous uphill to date, 1500m over two days. What’s more nerve racking is the fact that this is our first climb in India and therefore, in quite some time. The road was long and winding but thankfully the surface stayed good. Our biggest annoyance today was being shouted at by Indian tourists. 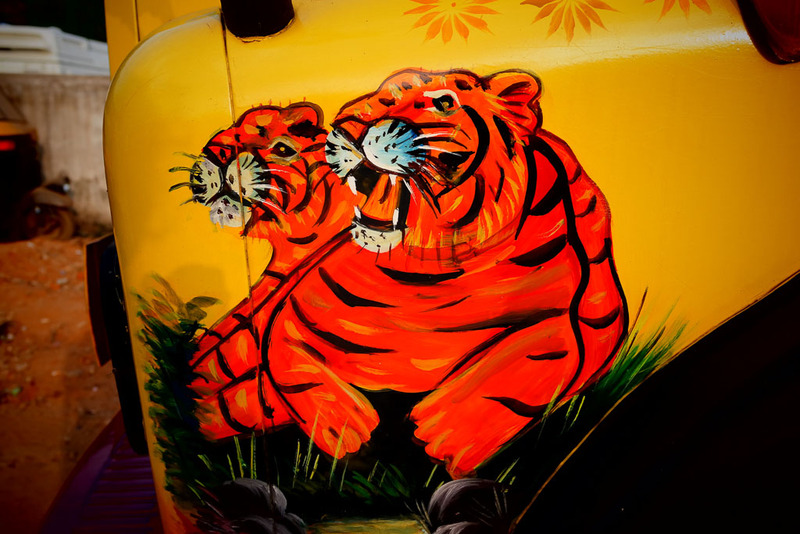 They seemed to be heading to Munnar by the bus load and on top of the honking of buses and tuktuks and jeeps and anything else that has a horn attached, we had to listen to the screams of busloads of people as they passed us. Sometimes it’s a constant “hello, hello, hello, hello, hello, hello, hello” and sometimes it’s just screaming. The idea that we would want to travel by bike is completely alien here and reactions to us vary from hilarious to downright rude. More than once we have stopped to have a drink to have a middle aged man come rightover to us only to stand staring without acknowledging us when we say hello. They’ll stand and stare for minutes on end and it gets pretty unnerving! Stopping for lunch amongst the rubbish! 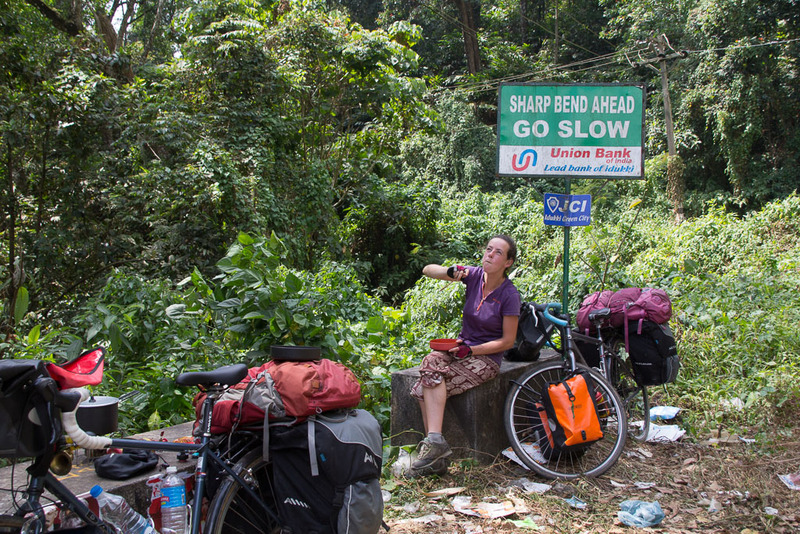 Our cycle was brutal, the hill seemed like it was never going to end until suddenly, we found we were in Munnar! It was a relief to arrive until we began searching for accommodation. The main difficulty is that often when we arrive, we are so tired that we just want to find a place. The first 4 places we checked were either ridicuously expensive or full. We eventually got a tiny box of a room but it isn’t very nice, draughty and seems to have a bit of a rubbish tip just outside our window. It’s tiny, you coudn’t swing a cat inside it and there’s not enough space for us to both stand up at once. As we intend to stay here a couple of days, we’ll scope out our options later. On the upside, there’s a tea stall near by selling plentiful, cheap and most importantly good, coffee, there’s a nice cool breezein the air, a welcome break from the oppressive heat of the lowlands and the tea plantations cling to the surrounding hills with clusters of dainty tea bungalows sprinkled throughout. Despite our fears for our ability, we have finished our longest climb yet and get to enjoy the mountains for a few days. People at mass in Munnar… whatever the time of day they always seemed to be there! Temperature has dropped below 25 degrees… time for a wooly hat! The centre of town, not pretty but lively. St George on a truck. This way for your giardiasis treatment! My eyes love going on camp. Temperature is below 22 degrees…. earmuff time! Sheena at our favourite roadside tea wallah where decisions were made and plans were hatched.